Hello Geekverse! I am happy to finally get this blog up and running! I have been working on this project for a while already, and thinking about it for even longer. So, what is this blog about? 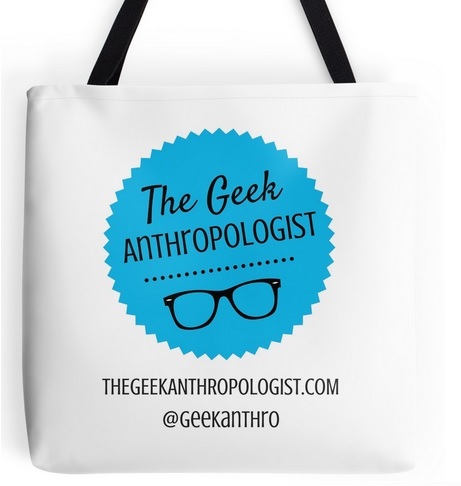 Well the title says it all, but let’s break it down a bit: the geek anthropologist is a blog about the anthropology of geeks, science-fiction and online communities. What do I mean by geeks? When I chose the name for my blog, I checked online to see if anyone was already using it or had a blog similar to the one I wanted to build. I found several blogs, most of which had not been updated in years, whose titles were composed of the words “geek” and “anthropology” or “anthropologist”. However, unlike the blog I was creating, these were not about the anthropology of geeks, the study of geekiness, but rather about anthropology itself, the authors considering themselves as anthropology geeks. I realize it is common to refer to people who are passionate and knowledgeable about a topic or activity as geeks: anthropology geek, music geek, science geek, and so on. But the expression ”geek culture” doesn’t refer to the culture-of-all-people-geeky-about-various-topics. Geek culture, at least according to my experience, is that of, for example, comic book fans, sci-fi and fantasy fans, science and robotics addicts, gamers, dungeons and dragons players and the more recent steampunk enthusiasts. To me, geek culture is, generally speaking, what you can find at your local Comiccon. Of course, I’m not forcing you to agree with my definition of geek culture: as I will discuss in an upcoming post, it’s pretty hard to establish a clear distinction between geeks and nerds, let alone define what geek culture is. I simply want you to keep in mind what I mean by “geek culture” when you read my blog, which again, is not about being an anthropology geek, but rather about proceeding to anthropological study of geeks and geekiness. Some examples of the use of the work ”geek” by artist Scott Johnson. “Sociocultural anthropologists examine social patterns and practices across cultures, with a special interest in how people live in particular places and how they organize, govern, and create meaning. A hallmark of sociocultural anthropology is its concern with similarities and differences, both within and among societies, and its attention to race, sexuality, class, gender, and nationality. Research in sociocultural anthropology is distinguished by its emphasis on participant observation, which involves placing oneself in the research context for extended periods of time to gain a first-hand sense of how local knowledge is put to work in grappling with practical problems of everyday life and with basic philosophical problems of knowledge, truth, power, and justice. Check of the AAA website for a more detailed definition of anthropology and it’s four main branches. Let us now consider geek culture, or subculture as some prefer to call it. How do geeks interact with each other? Are there certain gender relations dynamics specific to geek culture? Are geek romantic relationships similar or different from that of non-geeks? How do geeks organize? How do they form guilds in video games? What are the rules of Star Trek fan clubs? What are the criteria that establish one’s geekiness? What is geekiness? More importantly, what is geek culture? These are some of the questions I will explore in this blog. How do I propose to do this? Through participant observation, of course. Where? In online spaces, such as forums, social media, or MMOs; in conventions, such as Comiccon; or in comic book stores, fanclubs and LAN partys. Geeks meet in various spaces and context, for different reasons, and these encounters contribute to shape geek culture. I will also reference the work of anthropologists and other specialists. Although fairly recent, the anthropology of online communities is booming with fascinating studies. Pop Culture Studies have long been oriented towards the analysis of fandoms and geeky entertainment material. Additionally research on various topics, such as hip-hop culture, can help further understand some of the dynamics of geek culture (I swear!). I also wish to study the contents that geeks are familiar with, such as science-fiction and video games. I am particularly interested in the representations of certain groups in science-fiction and the importance of video games in people’s life, more precisely how they help them face life and not simply drag them from it as many seem to think. Why? Why do I wish to spend so many hours every week researching and writing for this blog? First, because I am a passionate comic book reader, sci-fi fan, part-time gamer and pop-culture reference lover. So as a geek, I want to share my passion and wish for geeks and geek culture to gain more proper respect. Second, because as an anthropologist, I strive to share my passion for my discipline as well as my conviction that the humility and willingness for intercultural dialog that underline it are essential tools for solving many of the problems we face today in the world. Along the way I will recommend reading material, discuss current events, and share advice for university students. I hope you will be along for the ride and that you will share your comments and impressions of my work with me! Enjoy!